80,000 Hyundai launched | What Car? If a Hyundai Sonata won't cut it in the office car park, the long-wheelbase Equus saloon could be the answer. Prices start at 70,000, making it the most expensive Hyundai on sale. 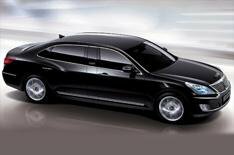 It's also the largest vehicle in Hyundai's range, and pitches itself as a rival for the BMW 7 Series or Mercedes-Benz S-Class. The 5.0-litre V8 engine, Hyundai's most powerful yet, produces 406bhp. If the chauffeur is driving, rear passengers are treated to a power-driven foot rest and seat leg support, plus a massage system in their seats. A bulletproof version has also been created three of which have been delivered to the Korean president, Lee Myung-bak. Keen customers will need to make their own arrangements, though, because the car has been launched in South Korea and it's unlikely that it will be imported to the UK.